Use the Intermapper and Automate interface to execute Automate tasks automatically in response to Intermapper alerts. When both tools are deployed on the Windows platform, you can automate key network activities such as restarting down devices, managing log file creation, or automating reports. Trial or licensed versions of both Intermapper and Automate are required to utilize the software interface. The Automate server must be running on the same machine as the Intermapper server. Automate and Intermapper must be deployed on the same Windows platform. You must be running Automate version 10 or later and Intermapper version 5.9 or later. Follow the steps below to connect Intermapper and Automate. Follow the instructions to install your InterMapper trial or licensed version. Follow the instructions to install your Automate trial or licensed version. Open Intermapper, and go to Edit > Server Settings. 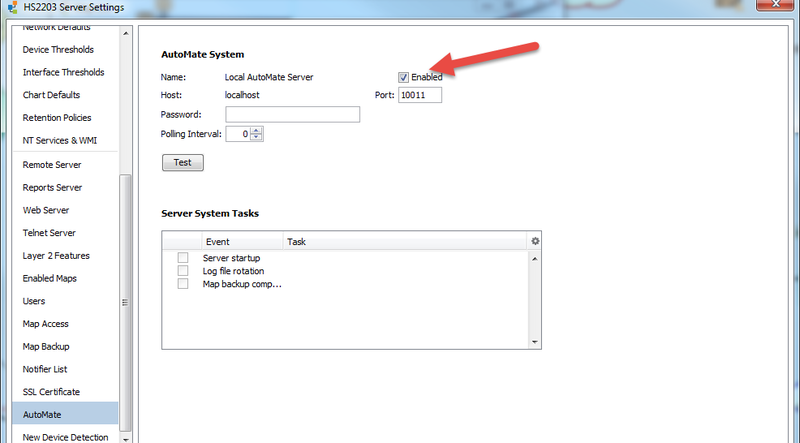 Under Automate, check the Enabled box. New to InterMapper? Learn more, or sign up for a free trial.